Last week I decided to pop along to the Headingley CCC event “Just Like Grandma Used to Make.” I hadn’t been to an event since Rachel and Jo took it over so I was keen to meet up with them over some cake! Unfortunately Granny M died before I was born and Granny C died when I was two so I didn’t have a Grandma to call on for a recipe. 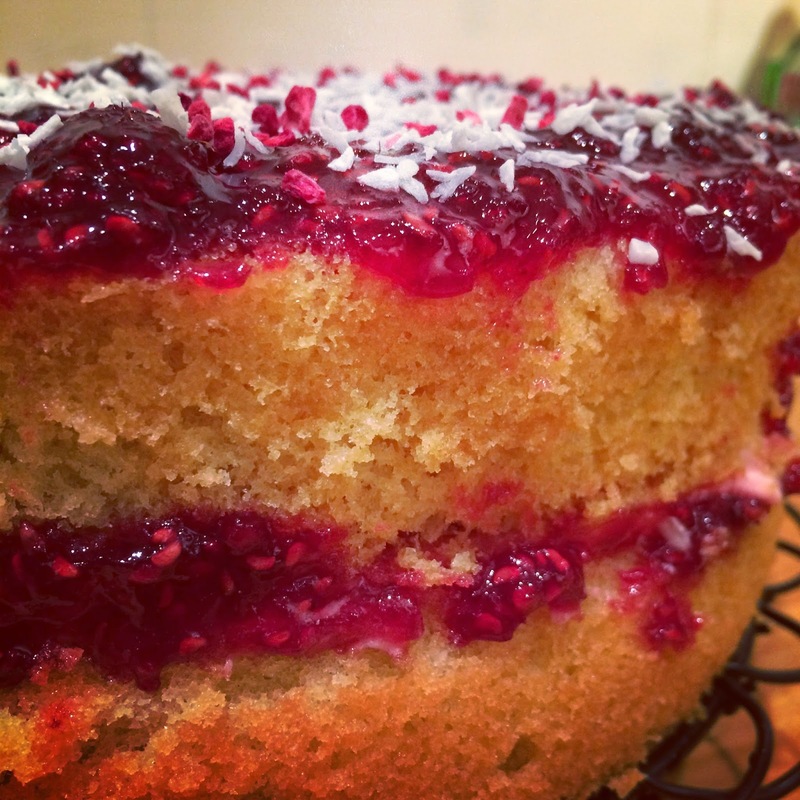 Instead I got thinking about what sort of cakes I have loved since I was little and I remembered having coconut and jam sponge, sometimes known as a Jammy Joey. They are far too moreish and I have yet to find them since I have been living in England so they are always high up on the shopping list when I go back home along with Club Orange and Tayto crisps. 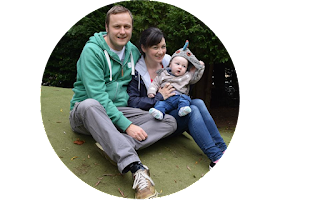 So… cake! I didn’t think this cake through properly before I made it and to be honest I just winged it. I knew what I wanted to make but I had been so preoccupied with other things that I had no time to plan until I started to make it. Next time I'll coat all of the outside in jam and coconut but I'm pretty pleased with how this one turned out. I see some blogs where recipes are only shared when they are 100% perfect but I don't mind sharing recipes that I can always improve on, it gives me a goal to work towards. It shows we are only human, not baking machines. I opted for good old Mary Berry’s Victoria Sponge for the base, I have used this as the basis of so many cakes and it never fails. It also shows how adaptable and diverse this wonderful little cake can be! Now Mary advises on the all in one method but I prefer to cream the butter and sugar together first, just personal preference. Alternate between adding an egg and some flour, whisking well the whole time. Once all the mixture is well combined divide between the two tins and bake in the oven for 25mins or until a skewer inserted comes out clean. Put all the ingredients in a bowl. Cover with a tea towel and whisk on a high speed for around 5 mins or until it is pale and fluffy. 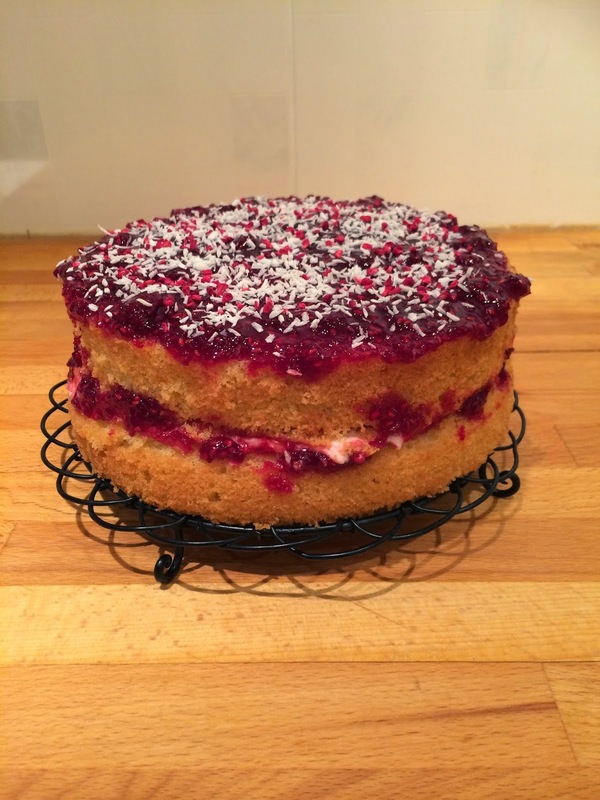 Spread all of the buttercream on top of one of the sponge layers, add a generous serving of raspberry jam and sprinkle with the desiccated coconut. 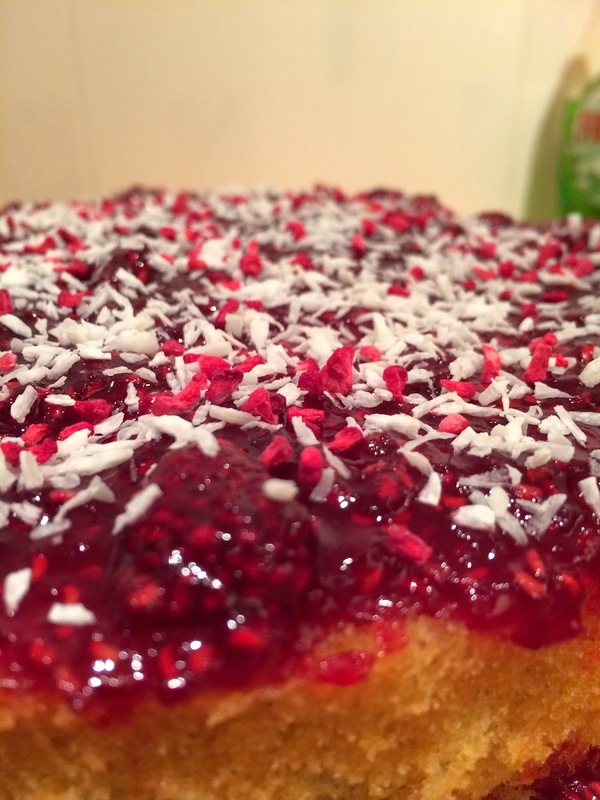 Place the second sponge on top, add more raspberry jam to it and sprinkle with more desiccated coconut. 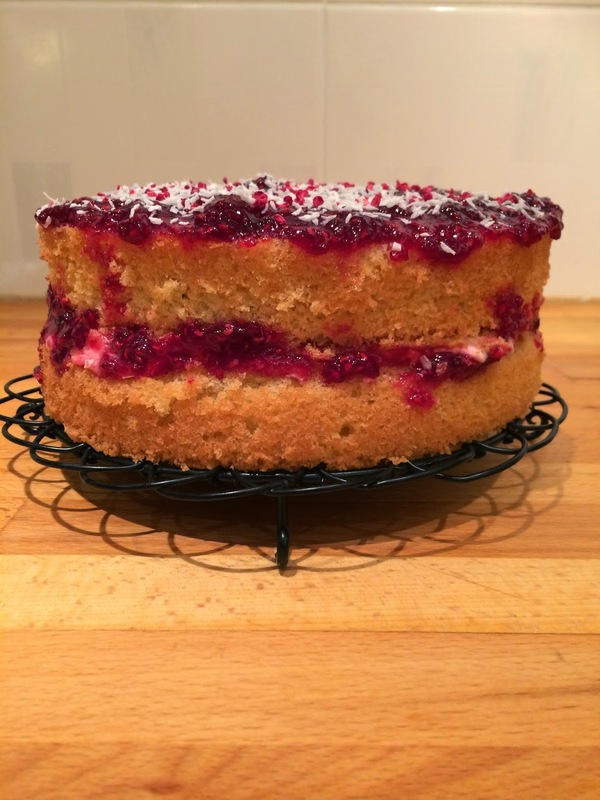 Add a final sprinkle of some freeze dried raspberries and enjoy!